The Word Works : Blogs : Consuming Japan : Smiles None. TV Huge. 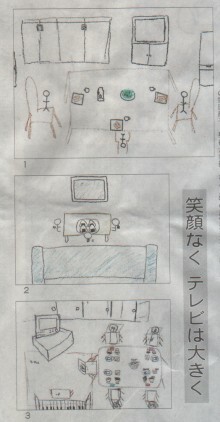 The images you see here were produced by Japanese 6th graders asked to draw a typical meal at home. The Asahi Shimbun’s headling reads, “Meals lacking conversation.” The subhead notes that people appear only as stick figures. Reading this story, I remember an article I cited in my book on Japanese Consumer behavior. “In ?eTractors, Television, and Telephones: Reach Out and Touch Someone in Rural Japan’, William Kelly describes the impact of TV on traditional household organization. In traditional households in rural Japan, he writes, the center of family life was the chanoma or family room. Family and household hierarchy were clearly delineated by the seating arrangements around the open rectangular where the family shared its evening meals and entertained its guests. The place of honor was the seat with its back to the tokonoma, the ceremonial alcove where seasonal flowers and paintings might be displayed. I also recall Iwamura Yoko (???? ?q)‘s Changing Families, Changing Diets (??????????A??????”??) (2003) in which the ADK researcher notes how women born since 1970 have stopped cooking for their families, it being so much less trouble to pick up something from a convenience store or, if well-off and gourmet, department store food hall.